For today's Travel Week post, I'll be talking about my trip to Sweden. 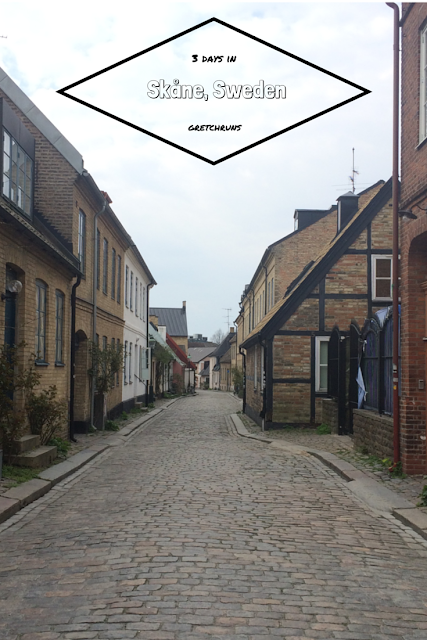 We visited the southern region of Skåne, and it was a lot of fun! We visited smaller cities than I'm used to in Europe, and I could definitely see myself living in one of these areas. Read on to see where we slept, ate and explored! -Skåne (or Scancia) County is the southernmost county in Sweden. The largest municipality in this region is Malmö, and Lund is the third largest (these are the two cities I visited). -The Øresund Bridge connects Sweden and Denmark and is the longest combined road and rail bridge in Europe. It's an incredible-looking bridge, and the train we took was the quietest I've ever experienced! It was amazing! -Valborg is an annual festival that celebrates the start of spring. While we were in Lund, there were tons of parties, concerts, outdoor drinking and bonfires. It was a huge event that included both students and families. We went to the university area, and there were choirs singing songs welcoming spring and everyone wore white caps. You can read more about it and see a picture of the festivities below! In Malmo, we stayed at the Scandic St Jorgen. I loved this hotel and would highly recommend it! The hotel was close to the train station and near the central shopping areas. Included with your stay is a breakfast buffet which was phenomenal. There were lots of vegetarian, gluten-free and organic options, as well as a juicer and blender. It was the best breakfast I've ever had from a hotel! We saved some money by staying in a bedroom without windows. There were lighted screens against the far wall, so it looked like sunlight was coming in. The views offered in other rooms weren't too great, so I think this is a great way to save some money without missing much. In Sweden, I visited a lot of coffee places, and Lilla Kafferosteriet was my favorite (one of the popular chains was Espresso House, which was also great). This cafe was made up of small rooms, filled with mis-matched furniture and large windows. It felt like I was at a friend's place for a cup of coffee and loved the cozy atmosphere! The drinks were also beautiful and tasted great. For dinner, we ate both nights in Lilla Torg, a touristy square in the center of town that is a must-see. There are lots of different options (even a TGI Friday!). We tried out Moosehead and Mello Yellow. Moosehead specializes in burgers, which were huge and delicious. Mello Yellow (above) serves traditional Swedish food, which I enjoyed! In Lilla Torg and other areas in Malmo, the restaurants have outdoor seating, which is open year-round thanks to heat lamps and blankets provided by the restaurant. It was a bit chilly at night, but it felt great sitting outside near heat and people-watch while we ate! In Lund, we visited the supermarket- Coop. It was HUGE and had such a wide variety of fresh foods. I like to cook as often as possible when I'm traveling, so we didn't actually stop in any restaurants in Lund. I would highly recommend checking out supermarkets and putting together a picnic while you're enjoying a new city. Our hotel was really close to Malmo Castle and Kungsparken, and we spent a lot time walking around the park. The grounds were so beautiful- full of small lakes, manicured paths, different types of flowers and trees, and tons of birds. It was such a beautiful and peaceful area that I couldn't help but spend hours wandering around and even went on a few runs through the endless paths! The castle itself is now home to a few museums, and is one of the more interesting buildings I've seen. Further north was the Turning Torso - an incredible-looking building close to the Sound in Malmo. We spent some time walking around the area and followed the beach back down to our hotel. The building itself is very striking, and is the tallest skyscraper in the Nordic countries at 54 stories! If you're interested in seeing how the Turning Torso was built, the construction of part of this building was featured on Discovery Channel's Extreme Engineering. Another park nearby was Pildammsparken. This one featured a huge lake (Pildammarna) as well as an outdoor gym and lots of beautiful gardens and open fields. There were a lot of runners out jogging around the lake, and even more birds! There's also an outdoor stage- it would be a perfect setting for an evening concert! As I mentioned, in Lund the locals (and some non-locals like us) celebrated the arrival of spring, and Stadsparken was packed! There was a DJ playing in the center of the park, and people were set up as early as 7AM. Around 2:00 everyone was kicked out and families were invited to come and enjoy the bonfires at night. It was a cool experience to see how people in other countries celebrate and interesting to see how calm and peaceful drunk Swedes can be. The most impressive building in Lund would have the be the cathedral. It's a huge, formidable building that was just as stunning on the inside. There is also a huge astronomical clock that was built in 1380, and stored from 1837 to 1923. Have you ever visited Sweden? What was your experience like? What is your favorite thing to do when visiting new cities? Um, thank you for these pictures and for going to Malmo and Lund! As you may know, I love me some Scandinavian crime novels, and some take place in Malmo and Lund so now I know what it looks like!! Sweden sounds so amazing! That building might be the coolest building I've ever seen. It was amazing..and I agree. SO cool! They were amazing! And I completely agree with you..so much better. One thing I loved about Stockholm was the city vibe but totally different from a US city. I knew I was in a city but things weren't as hectic as they are here. This probably sounds crazy but I have wanted to visit Sweden ever since reading the Girl with the Dragon Tattoo series. That plus they always seem to rank high on happiness surveys....I'm just fascinated with their culture!! Great photos and details! Wow, that sounds like a great trip! There's so many more places in Sweden and Scandinavia I want to check out. I might have to just move there..I loved the culture so much! Wow how beautiful! I would love to go to Sweden someday! Thanks Erin! I would recommend it if you get the chance! I loved this post & the pictures. What a great hotel breakfast! I bet running on the paths around the castle was so awesome. The spring festival sounds like so much fun. Have you ever been to Minneapolis? The biking sounds similar. They have an entire infrastructure (roads, on-ramps, signs, etc.) built just for bicycles separate from cars. So cool! Thanks for virtually giving me a tour through Sweden! :) That breakfast looks and sounds amazing. The Turning Torso is awesome too... I have watched a show about it (it was probably the one you mentioned.. lol) and I bet it was amazing up close and personal! That's so cool that you saw a show about it! It was a really amazing building up close. Really interesting! Fabulous! I'd love to go to Sweden one day! That's awesome! You have to go then. It's amazing!